According to Sungods in exile: secrets of the Dzopa of Tibet, a book published in 1978 and attributed to an Oxford Professor of ethnology, Karyl Robin-Evans (1914-74) but edited form his papers by his secretary David Agamon, a Polish Professor Sergei Lolladoff made an intriguing discovery in India. Shortly after the end of the Second World War in 1945, Lolladoff had purchased a Tibetan or Nepalese disc at the nineteenth-century hill station of Mussoorie (मसूरी Masūrī, Uttarakhand, India), which was attributed to the Dzopa people of the region. He showed the disc to Robin-Evans, who subsequently mounted an expedition to Tibet in 1947. Robin-Evans was received by Jetsun Jamphel Ngawang Lobsang Yeshe Tenzin Gyatso (ལྷ་མོ་དོན་འགྲུབ་) the fourteenth Dalai Lama (born Lhamo Döndrub) but, after his Tibetan guides deserted him, he befriended the people of the Baian-Kara-Ula region and learned their language, from which he was able to piece together the story behind the disc. The disc was made from stone, although its dimensions do not seem to be recorded. It is flat, with a sun-like design at its centre, from which two spiral arms turn in a clockwise diection through about 450° to its edge. There are designs on the disc partly superimposed over the spirals and partly following them. The most striking is a humanoid figure depicted (naked?) facing forward with arms and legs away from the central axis of the body, and a large domed bald head, resembling the archetypal ‘Grey’ alien. To its left are two spider-like objects, with circular “bodies” and eight sinuous “legs”. Beyond these is a reptilian creature seen in profile resembling a bearded dragon. To the right of the humanoid, beyond a poorly defined mushroom-shaped smudge, there is a series of character-like impressions apparently in two registers of six characters each. Beyond these is a lenticular shape with a central bar; beyond that are four more characters and finally, another quadruped seen in profile with a tail that suggests something mammalian rather than reptilian. All these designs occupy one of the spiral arms, the other being blank. The humanoid figure is the only design to extend beyond this decorated spiral into the blank. All the available images of the disc appear to derive from a single pair of photographs from Robin-Evans’s book, which show it from above and from an angle of around 45°. The two published photographs are monochrome, but there is a version commonly found on the web that has evidently been colourised. As the disc is said to be in a Berlin museum (although it is not specified which, at least one source says that it was a museum in the former East Berlin, so it ought to be a relatively simple task to identify which), it is curious that no-one has approached the museum for a better image than the two currently available. What are we supposed to make of the disc? The humanoid figure is presumably meant to represent an alien, which, according to Professor Robin-Evans, would be one of the Dzopa. 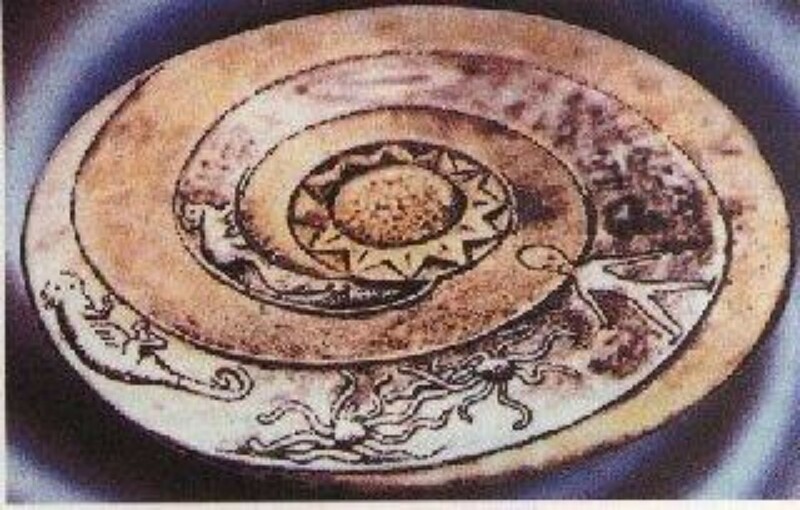 The lenticular shape is probably supposed to be an archetypal UFO of “flying saucer” type, although it also resembles ancient depictions of female genitalia. Quite what the two (perhaps terrestrial) animals are meant to mean is unclear. According to Robin-Evans’s research and conversations with their religious leader Lurgan-La, the Dzopa crashed in Tibet in 1014 CE following a previous exploratory visit around 20,000 years ago. They had arrived from a planet in the Sirius star system and were unable to return home. An alleged photograph of the fourteenth Dalai Lama receiving Professor Robin-Evans: remember that this is supposed to be in 1947! Does any further information exist among the papers of Professor Robin-Evans who, as Professor of Ethnology at the University of Oxford, must have left a collection of research notes, diaries and other materials? There is a problem. There is no record, outside Sungods in exile of anyone called Karyl Robin-Evans, professor or not. If he went to Tibet in 1947, he cannot have met the fourteenth Dalai Lama, as the thirteenth Dalai Lama, Thubten Gyatso, had died in 1933 and Lhamo Döndrub was still plain twelve-year-old Lhamo Döndrub; after his recognition as the reincarnation of his predecessor in 1935, he was educated to become the next Dalai Lama but was not enthroned until 17 November 1950. Phillip Coppens has published a photograph which, although not captioned, has a name (evansdaililama.jpg) that makes it clear is supposed to depict the Dalai Lama receiving the Professor. If the Dalai Lama was really twelve when this photograph was taken, he was a remarkably precocious developer (not to mention prematurely aged), while the good Professor does not look as if he would live another thirty years. 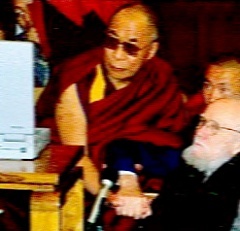 The Dzopa’s technology was also evidently very advanced, as the Dalai Lama appears to be looking at a laptop computer, the likes of which would not be seen again until the 1980s! Clearly, the photograph was not taken in 1947 (or, for that matter, at any date before Robin-Evans’s supposed death in 1974). Sergei Lolladoff is as elusive as Robin-Evans. All records of the two, outside the story of the “Lolladoff Plate”, have vanished. What is going on? Actually, the whole thing is resolved very easily. A quick check of Sungods in exile reveals that it was published as a work of fiction. French Ufologist Patrick Gross found the real David H Gamon (not Agamon! ), the author of Sungods in exile and asked him about the story. He was quite open about it being fiction, describing it as “his best hoax” (as he told Fortean Times in 1992 (Volume 62: 63)). 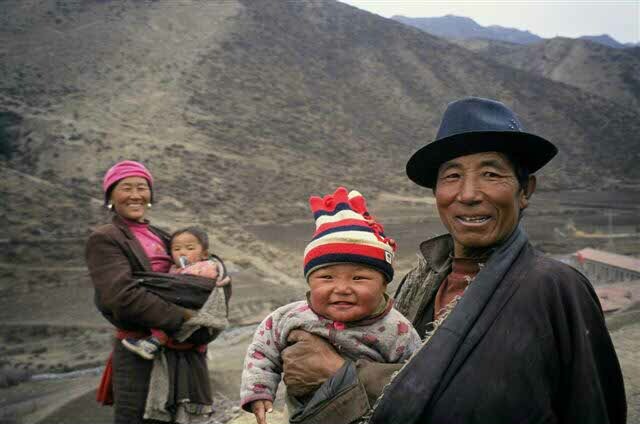 The ‘Dropa’ – David Gamon seems to have been the first to spell the name ‘Dzopa’ – are more correctly know as Dropka, a nomadic people of western Tibet and Nepal and not an alien species at all! In fact, the name means “herder” and is not an ethnic designation at all. So why has it been taken seriously (by some, at least)? The way it has been treated as factual is symptomatic of the nature of what passes for “research” among fringe authors, including Bad Archaeologists and Ufologists. Too often, statements made by one fringe writer are accepted as truthful without further checking (and, all too frequently, without acknowledging the original source). Worse, they are often unaware of the debunking work of others (or perhaps they choose to ignore it) and rarely seem to recognise acknowledged hoaxes. This is not the way that real scientists (and even archaeologists!) work: contentious statements need to be checked and re-checked, the reasoning behind unusual deductions must be stated in full, the hypotheses of others can never be repeated as facts and possible objections must be addressed before following new ideas to their conclusions. It is disappointing when even well regarded Ufologists such as Jacques Vallée repeat poorly researched (or even, it must be suspected, unresearched) assertions taken from earlier writers: this is particularly the case when such writers are dealing with historical documents or fieldwork carried out more than twenty or so years earlier. 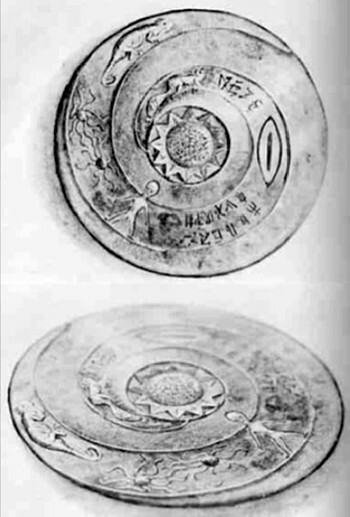 The reason why the “Lolladoff Plate” has been welcomed in some alternative circles is that it appears to be independent verification of the so-called Dropa stones. The Bad Archaeology website deals with this alleged discovery in some detail; the basic story is that a 1938 expedition to a remote part of China located the graves of a mysterious short people known as the Dropa together with 716 stone discs which, after translation, recorded the arrival of these people when their space-ship crashed. Although there are still those who maintain that it first appeared in the German magazine Das Vegetärische Universum in July 1962, the story can be traced back to a magazine called Новое Русское Слово (Russian Digest) published in 1960; it was called “Were Alien Visitors on Earth?” and was written by V Ritch and M Chernenko. None of the people it mentions ever existed and the story was clearly a hoax. The “Lolladoff Plate” has been the only apparently confirmatory discovery; both stories turn out, with little research, to be fictional. And the picture? David Gamon told Patrick Gross that “he probably made a rough sketch of the plate for one of his friends who had a forgery talent and who made a black and white painting of the plate and photographed it just enough out of focus so that it appears real”. The “Lolladoff Plate” is testimony to the laziness of some “researchers” and their willingness to accept wild tales that happen to confirm their beliefs, nothing more. Next A “Celtic Dolmen in Oregon?” – well, at least it’s a question! i love what you have done here, i love it! Hello… One of my students asked me to come here and comment. I am a professor of archeology at the University of Washington, Seattle. I have held the Lolladoff Plate in my hands…it is what is depicted and has been dated to be at least 10,000 years old. Well, Dr Cochran, what technique was used to date it? Something makes me think that you’re not quite who or what you claim to be: if you really are a professor of archaeology, it’s appalling that you’re not be able to spell the name of your discipline! I certainly wouldn’t want to be taught by you. That’s the American spelling of the word. And I thought it was the Yanks that were oblivious! Nonetheless, a quick Google search didn’t turn up any hits for the good professor above, so I believe you’re correct in that regard. Either that or he isn’t working as a professor anymore. my opinion is (i am doing graphics) that the photograph (showing in very poor resolution unfortunatelay) of the fourteenth Dalai Lama receiving Professor Robin-Evans is looking very much as Photoshopped. Another would say fake composition. If it helps. Sorry. The photo of the Dalai Lhama looks like Michael Jackson without his wig. The old man’s elbow is in his groin. The laptop is of about the time of the big scandals involving Mike. Clearly, it’s a period piece of satire that, like the medieval illustration of the death of Andronicus I, may become the basis of a new religion and nations will war because of it. So the spirits manipulating us decree. Wadawadawada. Mr. Wilson, I want to give you the benefit of doubt that you are a decent person. I have read your comments on other blogs, and you may be a victim of multi-generational abuse designed to facillitate “spirit” possession. It is often done in university settings (“personality testing”) and definately done to certain bloodlines by state-designated “handlers”, some disguised as a friend, relative, teacher, or doctor/dentist. I hope you have found peace with your past. wow…that’s hilarious. You’re nuts. Find help Natasia. You’re gonna need it. You’re wrong: I have a perfectly open mind, but it’s not so open that I will fall for any old nonsense. The thing with an open mind is that it must also be open to questioning what it’s being told. Too many people are happy to accept what they are told, especially if it seems to go against what the “experts” say. You are wrong to suggest that I have fixed beliefs and am unwilling to explore possibilities. I have changed my mind about so many things, but always when presented with evidence that my previous beliefs were wrong or misguided. I am ignorant of many things, but as a scientist, I am happy that this is a normal state of affairs: it’s exploring the edges of what we know and can know about the past that drives me onwards. Im skeptical to this disk existence or interpretation, BUT… I must say the author of this text just kept saying was a fraud and fraud but actually did not “disprove” anything. And here are a few questions I have and some exploratory attempts. First, him saying was the dalai lama, well before the reincarnated lama is found out, there is one of the elders who are in lieu of the lama, the man could simply mistaken the man for being a lama. The fact that part of the account may be wrong or innacurate does not invalidate the whole of it, some people feel the need to embezzle their stories, others just make mistakes. Also Id dare say due to the website name and the adjectives used in the texts along with supposed answers that are as substantial as the story on it is, I find hard to believe you keep an open mind. As far as hiding historical records and evidences we all know thats not exactly hard with the right amount of money or influence, for much less more important pieces of archaeology and sites were destroyed along with their evidences. I think that skepticism is healthy and not only to others but also towards ourselves, and as much as Im on the fence regarding this disk , your post did not resemble an investigative work, just a mud fight. Hopefully it can become more attained to facts and evidence which makes more sense to me. Well, Lucianaiana, here’s an attempt to answer you. Look at the face of the alleged Dalai Lama. It is clearly the current incumbent, Jetsun JampheL Ngawang Lobsang Yeshe Tenzin Gyatso (བསྟན་འཛིན་རྒྱ་མཚོ་), who was born in 1935; it’s the face of a mature man (over 50, I’d guess) and consistent with a date in the late 1980s or 1990s. Look at his spectacles. They are wire framed and tinted, a style that is consistent with a time from the later 1970s onward. Have you spotted that in addition to the object I’m calling a laptop (and that is the easiest interpretation of what it is), there is a microphone? It’s the sort of microphone that’s been in use since the later 1960s and is still in use today. It’s nothing like the sort of microphones that were available in 1947, Nazi technological accomplishments notwithstanding. Yes, the picture could have been manipulated, but to what purpose? It is published on a site that is making the claims I’m attempting to debunk. Why would the author of that site manipulate a genuine photograph from 1947 to make it appear to feature technology not available until the 1980s? You’re wrong to question the openness of my mind. I am as open to new ideas as anyone; if those ideas involve archaeological claims, they grab my attention and I can bring my professional knowledge to bear on assessing them. I love discovering new things about the past; I love exciting new ideas about the past; I love seeing long-held beliefs turned on their head. The problem is that such new ideas require evidence. What we have here are unsubstantiated travellers’s tales, fraudulent books written by non-existent academics and an acknowledged hoax object. Regarding the authenticity of the “Lolladoff Plate”, there is no fence to sit on: the person who hoaxed it has said he hoaxed it. Case closed. It’s the “facts and evidence” (your phrase) that cause this story to crumble! I do believe governments strategically plant bogus UFO stories into the public domain to discredit valid UFO incidents. However, the lack of any secondary source to corroborate the Lolladoff Plate’s existence leads me to believe they are a total hoax. Given that a few Native American oral traditions claim alien ancestry, Agamon’s fictional story does not totally discredit the Dzopa (Drop-ka) people’s ancestral claims. BTW, it’s *embellish not embezzle. David H (not A) Gamon ought to be thoroughly ashamed of himself, though I fear he is not. He was fascinated then by ‘flying saucers’, contemptuous of sloppy research, a strong Christian who detested the way flying saucers are made into a pseudo-religion, and (then, anyway) a very clever satirist. The reason he ought to be ashamed of himself is that he agreed to the publisher’s suggestion that the last few pages should be cut — which revealed that it was a hoax. But there are enough clues on the first page! Thank you for putting things straight! Chris Aubeck visited me a few months back and wanted to mention my book in his own now published ‘Passport to Magonia.’ I said to him that I had been three dull things in my life, a schoolmaster, a churchgoer, an elected councillor and this (my sole hoax) was another suppressed side of my bursting out. I continue to be unrepentant. D.A. What do you say to these Egyptian images depicting modern day flying vehicles? How do you explain the depiction of our solar system on this ancient Sumerian tablet? Elongated skulls found around the world…and are depicted in many Egyptian works of art. It is widespread knowledge that Ancient Egyptians mutilated their skulls by using certain objects to stretch their skulls, to look like the ones in this photograph. I am not saying that is not true… The thing you have to ask yourself is why did the egyptians adopt this practice. Because… Aliens visited Egypt and they were probably taken for gods, and naturally the egyptian elite and other leaders and elite around the world who were also visited wanted to be like them. Well, Mark, the site from which you got the images of “modern day flying vehicles” explains exactly what you’re looking at: an earlier inscription overwritten by a later one, the two combined hieroglyphs happening to look a bit like a jet ’plane and a helicopter. The thing is, it’s writing, and we can read exactly what both the earlier and later inscriptions say. No need to jump to unwarranted conclusions. The Sumerian cylinder seal (not a tablet!) depicts something that looks to us like a bright star surrounded by planets. What did these symbols mean to the Sumerians, though? Isn’t it possible (if not more likely) that they are all stars? And to platy the Devil’s advocate, how do you know that it’s supposed to be our solar system? Why couldn’t it be the solar system of Zeta Reticuli? Mutilated skulls are not an Egyptian phenomenon. You’ve linked to some images from a restricted period of art (the so-called Amarna style, that lasted for less than a generation) in which the backs of the heads were curiously elongated. This period coincides with the worship of the Aten as the only permitted god; Aten is only ever shown as a solar disk with rays extending down to earth, ending in hands offering the royal family the symbol for life. No other gods are depicted at this period or even admitted to exist. Showing elongated skulls is not a way of mimicing aliens “taken for gods”. The killer fact for the idea that these are depictions of people with deformed skulls is that we possess the remains of some of the actual people depicted and they have perfectly normal skulls. It’s an artistic representation done for ideological reasons, nothing more. So Philip Coppens apparently took a picture from the internet to illustrate the Dalai Lama without caring to check its origins. In reality, “Prof. Robin-Evans” does not exist and the David Gamon who created him out of thin air is a joker. It’s so easy to lead others to dismiss events when you can invent some BS about them, which makes it much harder, especially for some, to examine claims dispassionately. 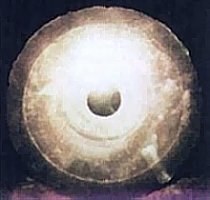 David Gamon’s book was not a reliable primary source of claims of Dropa stones, and it never will be. its such a shame that we may never know the real truth behind the dish. I am always a little bit skeptical when such important discoveries have limited or no access to them. Until we are allowed to examine the dish more closely I think we should remain suspicious. The dish never existed. Please read the post. Your analysis seems very good to explain even 9/11 hoax. So if you are right, with the same logic (photos/videos out of focus, artifacts shown but not seen or touched by anyone for real, wrong people in wrong place in wrong time, strange unexplained numbers in politics, economics, history, numbers manipulated without logic and without trace, statistics, money mass is growing (why? ), etc, etc, etc). There are so many hoaxes around, before, today and even more will be tomorrow, so that this one, you are analyzing, is (if it is hoax at all?) so naive. Something strange has happened long time ago and is still happening, no doubt about it, Dogons are telling that for hundreds of years. But to conclude, if something happen, what ‘someone’ doesn’t want to be understood or known to common people, best way is to find scientist(like you) to explain it to these poor common people in ‘hoax’ way. I guess that English isn’t your first language, but I think that you are trying to be sarcastic. From what I understand, you think that my analysis of this story is a one-size-fits-all type of explanation that could be applied to just about any “mystery”. I also think that you are trying to suggest that there is a conspiracy among scientists to prevent the truth from being made public. Well, that is rubbish. My analysis of this story follows the trail of evidence. You will even find that the original author of the fiction about the Lolladoff Plate has left a comment on this blog explaining that readers of Sungods in Exile ought to have spotted that it was a hoax on the first page. Try to rescue its veracity by reference to the Dogon if you like, but the Dogon have no tradition of alien visitation. Your accusation that I am trying to dupe the “poor common people” (your phrase) into believing that alien visits didn’t happen in the past is just plain laughable. If there were any evidence whatsoever for aliens visiting Earth in the distant past, there would be archaeologists shouting it from the rooftops. I would join them. The fact is, there is no such evidence. Your last sentence is proof of my thesis, ‘there is no such evidence’. This plate-case was maybe simple to prove, it’s hoax, but how can you be so sure that some other evidence out there is not the right evidence. For hundreds of years we were learned to understand world around us in certain ‘controlled’ way and our minds were always only partially open (or completely closed) for unexpected. But, if we dig into the past of human development, only the ones with strange thoughts, actually moved on, and it was never interest of elites to have free open minded people around, able to understand and see things in right way. They like to control and many of us are not conscious of that to understand this, most of us think that we are in control, but unfortunately, we are not. If you are looking at Mona Lisa from one angle and I’m looking from another, she is smiling to each of us, but if I take a picture and you don’t, I have a proof, she is smiling ONLY at me. In other words proof about something is very questionable, if opinion is heard and evidence is coming from only one source/side. I didn’t mean to offend you personally, but waiting for ‘unwanted’ proof about aliens or other kind of unexpected (not fit to any standard theory) is loosing game. Proof will not come by itself, and even more, not from ‘regular’ archeologists, not because they are not good, but because they will not be allowed to publish that. By the way, how do you know what is Dogon’s perception of alien? And regarding their tradition and rituals, their complete way of life and religion is proof of strong influence by something or someone, as they live quite differently to other native tribes around them, so I openly strongly support thesis that Dogons were influenced by out of Earth aliens sometime in the past. My opinion is that we (relatively well educated people) should try to look at every artifact from alternative angle. I have tried that few times (I’m engineer, not historian or archeologist) and it inspired me to take a slightly different stand about something than before. Daniken (but not only him) was trying to understand ‘regular’ artifacts in different way and later after publication of his books, we have got thousand of studies trying to deny (minimize importance of) his opinion/work, why, if it was just a hoax. Sorry for my bad English, I’m not English native speaker, although I hope I’m understandable enough. Daniken has been refuted on nearly a %100 of his claims. Authors and researchers then copy his “refuted” work over and over again presenting it as a cogent argument. It’s what all the contentious remarks are from the scientific community and beyond. It contravenes the essence of ufology. Not to mention he flat out lies or leaves out facts to promote his theory in his books, shows and movies. I’ve seen a flying saucer, I believe. It’s people like Daniken who give ufology a bad “tin foil hat” name. I digress, personally I think the Nephalim theory fits best that’s why we’re not finding any alien artifacts. As well it explains the ancient stories of demigods and so forth. As for the author I find nothing in your article that tells me your not open to theory’s involving radical ideas. Nor for that matter does it appear you provide any anecdotal evidence. You sir just want proof and there is absolutely nothing wrong with that. It makes you a very sane man. Milli, to know something, you first need evidence of its very existence. To ‘believe’, you don’t. That’s why many cherished beliefs have been crushed since mankind invented the Scientific Method. If you really have an open mind, you should remember this: Knowing and believing, are very different things.